The thylacine sounds like something out of a children’s book: it was an animal with the body of a dog, a kangaroo’s tail, a pouch, and stripes from its shoulders to its tail. It is said to have had an awkward gait and was rarely seen to move quickly, yet it was a proficient carnivore, preying upon a variety of marsupials under the cover of darkness. Thylacinus cynocephalus (dog-headed pouch-dog), also known by its more common name the Tasmanian tiger, was once an apex predator throughout mainland Australia, Tasmania and New Guinea. This unusual creature is an excellent example of convergent evolution, which occurs when two unrelated species are put under similar evolutionary pressures and exist in a similar ecological role, producing two species that possess similar features. In other words, similar problems produce similar solutions. Although the thylacine superficially resembled members of the family Canidae (such as wolves and dingoes) with its sharp teeth, raised heels, muscular jaws and dog-like body form, its marsupial pouch, kangaroo-like tail and relatively short legs point towards the fact that this species is only distantly related to its canine doppelgangers. It was the only extant member of the family Thylacinidae, its closest relatives being the Tasmanian devil and the numbat. One of the few photographs taken of the last thylacine, a resident of Hobart Zoo. Photo courtesy of Australian Museum. The modern thylacine evolved around four million years ago, and although it had previously been found throughout continental Australia, it became extinct on the mainland at least two thousand years ago. The mainland extinction was possibly due to competition with dingoes. However, this is arguably related to the two species’ opposing lifestyles: dingoes typically hunt during the day, whilst thylacines were mostly nocturnal. The thylacine's last stronghold was the island of Tasmania, but the arrival of Europeans to Tasmania in 1803 spelled the beginning of the end for the marsupial carnivore. When sheep were introduced to the island in 1824, the thylacine began to gain notoriety among farmers as the culprit responsible for attacks on livestock. While Tasmanian tigers would have had some effect on the growing population of sheep on the island, their impact was greatly exaggerated. One infamous photo of a Tasmanian tiger with a chicken in its mouth is now thought to have been staged, with the photographer likely to have created the scene by placing a dead chicken in the mouth of a taxidermied thylacine. Due to the hype surrounding its apparent effect on livestock, a bounty was placed on the thylacine, with the Tasmanian government paying one pound per head. 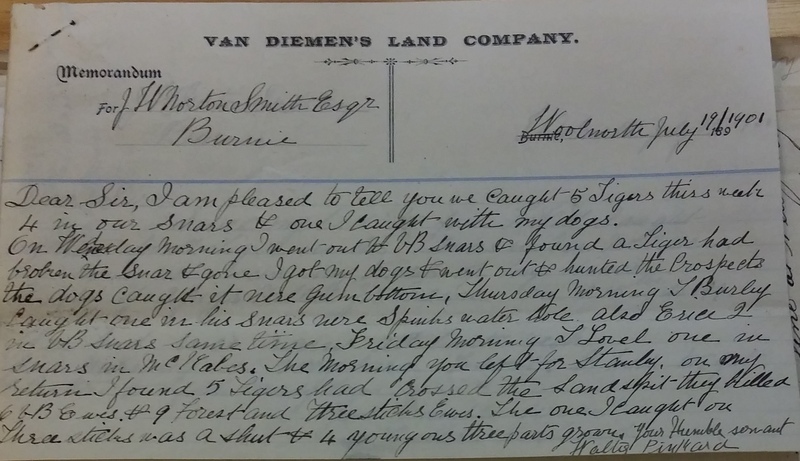 Between 1888 and 1909, over 2184 bounties were paid out to farmers and hunters alike. 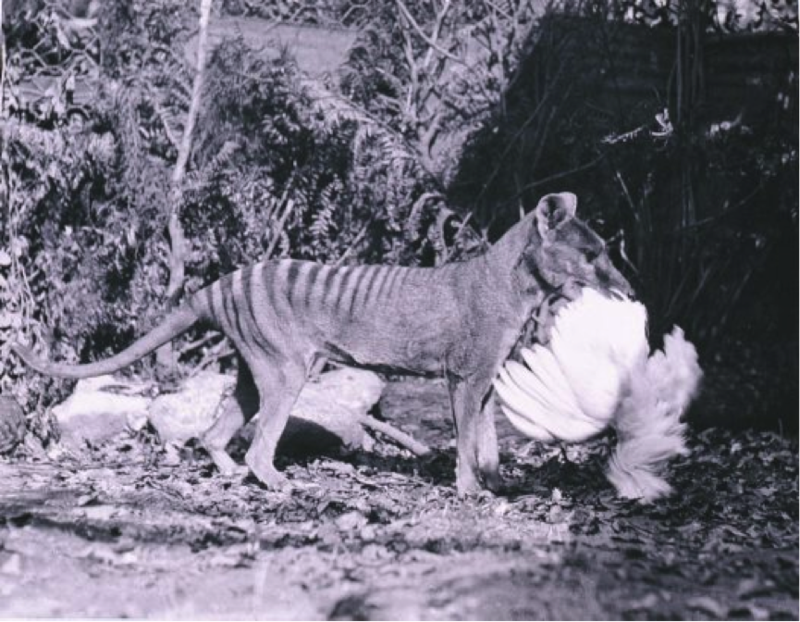 The infamous image of a thylacine with a chicken in its mouth - most likely staged. Photo courtesy of Australian Geographic. By this time, hunting had taken its toll on the species. Thylacine sightings became infrequent, and zoos around the world sought after the strange animal. Still, the extermination undertaken by farmers and hunters continued. The last known wild thylacine was shot by farmer Wilf Batty in 1930, and then finally, the last captive thylacine died in Hobart Zoo on the 7th of September, 1936. Only then, once the last known Tasmanian tiger had perished, was it placed on the threatened species list. Ultimately, having not been seen in the wild for fifty years, the thylacine was declared extinct in 1986. In addition to the hunting pressure brought about by humans, the demise of the thylacine has been attributed to habitat loss, competition with dingoes and introduced wild dogs, and the concurrent demise of its prey species. The extinction of this mysterious marsupial is commemorated every year on Threatened Species Day, which falls on the 7th of September: the day that the last known Tasmanian tiger died. Now more than ever is the loss of the thylacine relevant to the struggles we face in trying to combat the extinction of our native animals, and should serve as a reminder not to take our unique wildlife for granted. Victoria is home to an array of species that not only fascinate and inspire, but also play an integral role in their respective ecosystems. Personally, I would have treasured a sighting of a Tasmanian tiger in its natural environment, but sadly this is something that I and countless others will never experience. We need to rally behind our native wildlife today so that as we grow old, we will not look back and wish we had done more. Australia has the worst mammalian extinction rate of any country in the world, having lost 29 species over the past two centuries. I wonder, what is in store for the next 200 years? A combination of all known video footage of the thylacine. Courtesy of The Thylacine Museum.